The goal of this RuralStart townhall event is to bring the amazing energy and atmosphere that you’d find at SxSW to rural communities. These events hold so much potential in educating members of the community about the synergy that occurs when you bring passionate people together and empower their voices. 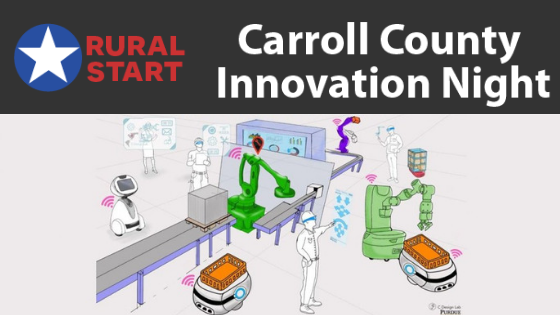 Startups from all over the United States represented during this 2-hour event, robotics demonstrations and panel discussions about the ways we can all come together and use innovation as a catalyst for helping to improve quality of life! There may even be a few surprise guest speakers too! This will all take place in an old building that will hopefully be converted to an innovation center (if the grant dollars come together to make the project a reality). Thanks to everyone from so many parts of the country for helping pull this together. The impact on inspiring both the young and older members of the community is going to have such a huge impact! Bloomington: Entrepreneurial Ecosystem Study Rollout: What We Learned and What’s Next?